Subscribe to receive hike schedule and updates. Like us, or even love us. SSVC at Cedar Cliffs, overlooking where the Atlantic Coast Pipeline route could be. SSVC is a chapter of PATC based in the Southern Shenandoah Valley. Many of our members are from the Harrisonburg-Staunton-Waynesboro area. We hike several weekends each month. We also have a short hike one Wednesday each month, usually followed by lunch at a restaurant. Most of our hikes are in the George Washington National Forest or Shenandoah National Park. Our chapter maintains a 2.5-mile section of the Appalachian Trail in the Southern Section of Shenandoah National Park. 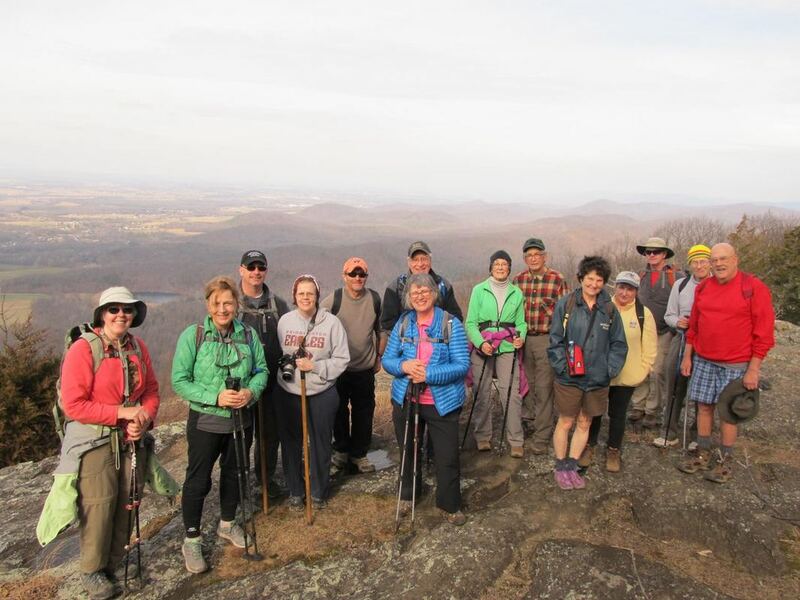 We also have a group that works on Shenandoah Mountain trails. In addition, several of our members have adopted trails. Our tradition is to help each other on our adopted trails. Anyone is welcome to join us for a hike or for a worktrip. After each hike or worktrip we post photos on our Faceook page. Questions? Contact President Malcolm Cameron. To become a member of SSVC, join PATC and indicate an interest in SSVC on the membership form. You may join PATC electronically. You will enjoy your hike more if you are adequately prepared. Plan for an all-day hike. Bring lunch, water, and raingear, and wear sturdy shoes. If you are not accustomed to walking long distances, build up your endurance by walking a few miles several times a week. Include some hills in your route. In the past 5 years, Virginia has seen a big increase in Lyme disease. We all need to be aware of how people can get it, symptoms, and the importance of early treatment. See the Center for Disease Control Lyme Disease for good information. One of CDC's recommendations for prevention is to: "Use products that contain permethrin on clothing. Treat clothing and gear, such as boots, pants, socks and tents. It remains protective through several washings. Pre-treated clothing is available and remains protective for up to 70 washings."